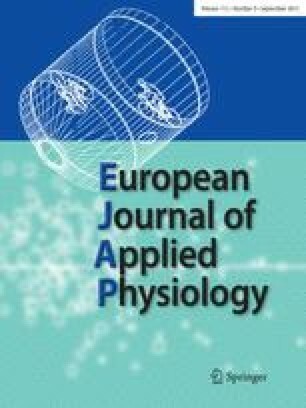 Eccentric endurance training in subjects with coronary artery disease: a novel exercise paradigm in cardiac rehabilitation? This study evaluated the effects of 8 weeks of eccentric endurance training (EET) in male subjects (age range 42–66 years) with coronary artery disease (CAD). EET was compared to concentric endurance training (CET) carried out at the same metabolic exercise intensity, three times per week for half an hour. CET (n=6) was done on a conventional cycle ergometer and EET (n=6) on a custom-built motor-driven ergometer. During the first 5 weeks of the training program the metabolic load was progressively increased to 60% of peak oxygen uptake in both groups. At this metabolic load, mechanical work rate achieved was 97 (8) W [mean (SE)] for CET and 338 (34) W for EET, respectively. Leg muscle mass was determined by dual-energy X-ray absorptiometry, quadriceps strength with an isokinetic dynamometer and muscle fibre composition of the vastus lateralis muscle with morphometry. The leg muscle mass increased significantly in both groups by some 3%. Strength parameters of knee extensors improved in EET only. Significant changes of +11 (4.9)%, +15 (3.2)% and +9 (2.5)% were reached for peak isometric torque and peak concentric torques at 60° s−1 and 120° s−1, respectively. Fibre size increased significantly by 19% in CET only. In conclusion, the present investigation showed that EET is feasible in middle-aged CAD patients and has functional advantages over CET by increasing muscle strength. Muscle mass increased similarly in both groups whereas muscle structural composition was differently affected by the respective training protocols. Potential limitations of this study are the cautiously chosen conditioning protocol and the restricted number of subjects. We thank Christoph Lehmann for technical and Liliane Tüscher-Gfeller for clerical support. We thank also Sharzad Naderi and Daniel Troxler for the Cybex measurements, Franziska Graber for morphometric muscle analysis and Hans Howald for proofreading and checking consistency of the manuscript.